I got a lot of responses from recent post on a possible RMB devaluation (see Searching for China's (financial) WMDs). Most of it was push-back from likely readers of Zero Hedge*. Almost daily, we are seeing headlines about weakness in the Chinese economy. 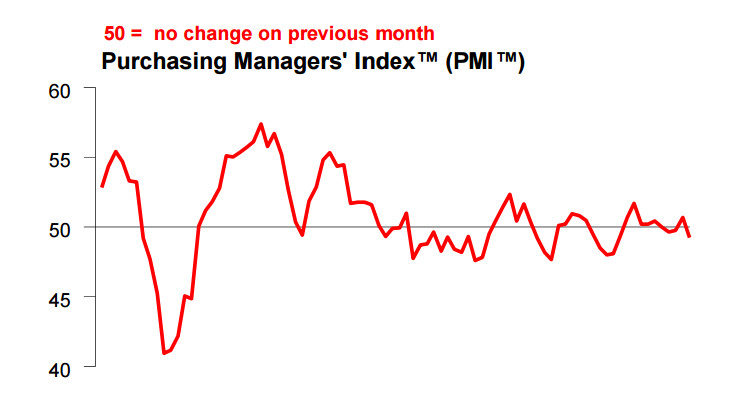 As an example, the latest HSBC Flash PMI contracted to 49.2, which was an 11-month low and indicated contraction. Readings like these created pressure for more stimulus and raised expectations of currency devaluation, especially if you read ZH. My previous post used a military analogy to watch for signs of a RMB devaluation and I will try to continue that framework in this case (see Searching for China's (financial) WMDs). If you were going to war, what you would do is mobilize your troops. Rush combat aircraft to the front. Cancel all leave and call up the reserves. The governor of the People's Bank of China released a time schedule on Sunday to make the country's currency more user-friendly as a step toward making international investments easier. The reform aims to meet the International Monetary Fund's requirements before its evaluation on whether the yuan could be a part of Special Drawing Rights. This means the yuan would join the US dollar, euro, pounds sterling and Japanese yen as part of the supplementary foreign exchange reserve maintained by the IMF. "By the end of 2015, the last year of the 12th Five-Year Plan (2011-15), China plans to make the renminbi capital account convertible," said PBOC Governor Zhou Xiaochuan when he met chief executive officers from the world's top business groups at the China Development Forum in Beijing on Sunday. Zhou said: "It is time to change the current policy that restrains Chinese individual residents from buying equity and financial products in overseas markets. Also the Qualified Foreign Institutional Investors plan is not flexible enough to satisfy foreign residents' investment needs on the mainland. "A set of pilot policies and regulations will be released this year, to basically achieve the requirements for a currency that can be used more easily." In other words, full convertibility is a prerequisite to the internationalization of the yuan. If China were to devalue now, it would create untenable pressure on the CNY trading band. The progress China has made so far marks a rare victory for Beijing on the world stage, officials from both inside and outside China said, and the careful planning by Beijing is making the new bank a more serious challenge to U.S. dominance of the international economic system in place since the end of World War II. Beyond giving up a veto, Beijing is also trying to address concerns from the U.S. and elsewhere about the institution’s transparency and governance. Jin Liqun, a Chinese official picked by Beijing to set up the bank, has been lining up retired World Bank staffers in Washington to help them work out governance issues and to build up the new bank’s credibility with Western countries. One of his first recruits is Natalie Lichtenstein, a former World Bank lawyer. Ms. Lichtenstein declined to comment on her role at the new China-led bank. Mr. Jin, interim chief of the new bank, said over the weekend that more than 35 countries will join as the bank’s founding members by the end of this month. South Korea and Australia, U.S. allies in the Asia-Pacific region, are expected to come on board by then, according to Chinese officials involved in the effort. In a speech to a regional forum Saturday, Mr. Xi presented China as a partner willing to “jointly build a regional order that is more favorable to Asia and the world.” He highlighted a new China-led infrastructure bank and other initiatives designed to leverage hundreds of billions of dollars to finance railways, ports and other development projects, and foster regional economic integration. Throughout the 30-minute speech, Mr. Xi stressed that China’s vision, while centered on Asia, was open to participation by all countries. He was careful not to place China at the center of this emerging order, as some regional politicians and security experts have warned could happen. But Mr. Xi said given China’s size, it will naturally play a larger role. “Being a big country means shouldering greater responsibilities for the region, as opposed to seeking greater monopoly over regional and world affairs,” Mr. Xi told the Boao Forum for Asia, an annual China-sponsored conference named for the southern seaside town where it is held. Undoubtedly, the AIIB will finance itself by issue yuan denominated bonds, once the yuan is internationalized. China’s planned infrastructure bank will have $100 billion in capital. Properly borrowed against, that pool could provide $1.3 trillion in financing—still short of the trillions in estimated infrastructure demand, according to Fred Hu, a founding partner of Primavera Capital Group. If China were to effect a major devaluation now with, say, a shock-and-awe QE program, Beijing would lose face in a major way. Viewed from that context, better to suffer some short-term pain for long-term gain. That's why a major devaluation of the RMB is highly unlikely in the immediate future. * Where would we be without ZH? It's the financial equivalent of the supermarket tabloid detailing the deathbed confession of the soldier who guarded the aliens who landed at Area 51. I would love to say that I am right all the time, but the market gods will humble anyone who does that (hence the name of my blog "Humble Student of the Markets"). Last week, I was leaning bullish (see The bulls are alright), but that directional bet worked for all of one day before reversing downwards. 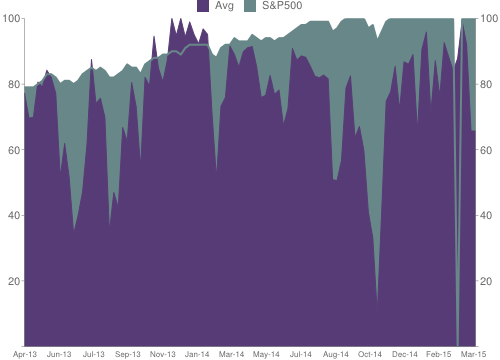 Above we see a chart of the total number of SPX stocks making 5, 20, and 100-day new highs vs. new lows each day. 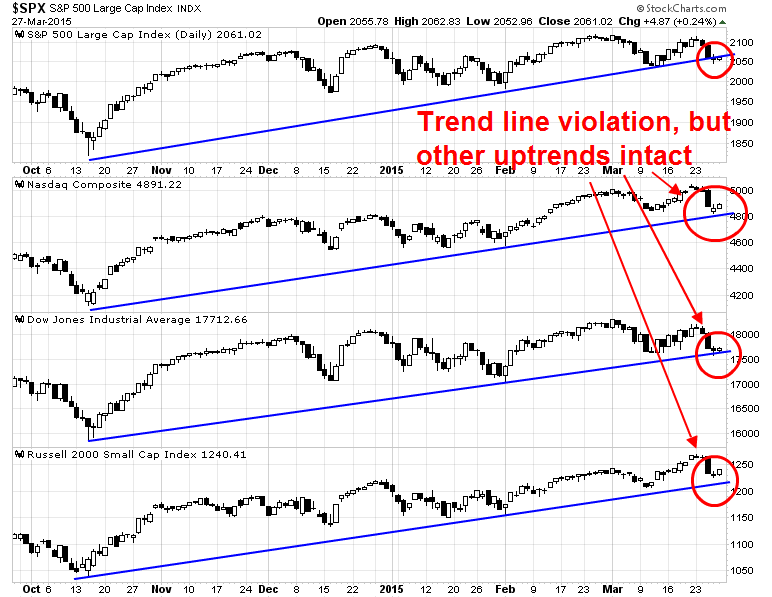 Note the tendency of this multiperiod breadth measure to top ahead of price during intermediate-term market cycles. The measure has remained strong recently. Interestingly, going back to 2012, when the multiperiod measure has been positive (more stocks making new highs than lows), the next five days in SPX have averaged a gain of +.15%. When the measure has been negative, the next five days in SPX have averaged a gain of +.71%. Yet another example of how momentum trading (buying strength and selling weakness) has not worked for stock index traders in recent years. 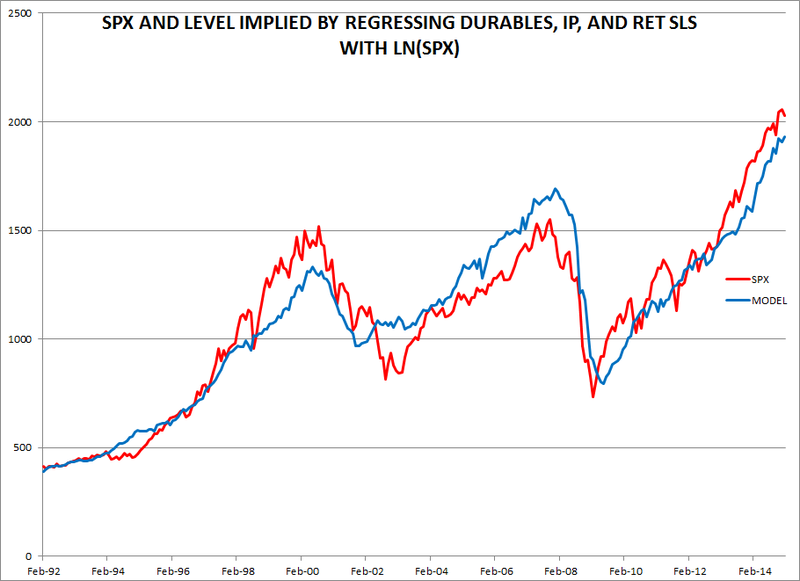 Overall, chasing new highs and stopping out of long positions on expansions of new lows has brought subnormal returns. We have had a trending environment since 2012, but not a momentum environment. Understanding that distinction has been crucial to stock market returns. My base case scenario is a choppy market, but with an upward bias as the intermediate term trend remains bullish. There was much consternation among technicians when the SPX broke down through an uptrend that began last October. However, an examination of the other major US equity averages, namely the NASDAQ Composite, DJIA and Russell 2000, show the uptrend remains intact. There are plenty of additional signs of a bullish intermediate term trend. Regular readers also know that the Trend Model uses inter-market analysis to spot global trends. Simply put, I am not seeing any signs of major weakness overseas. 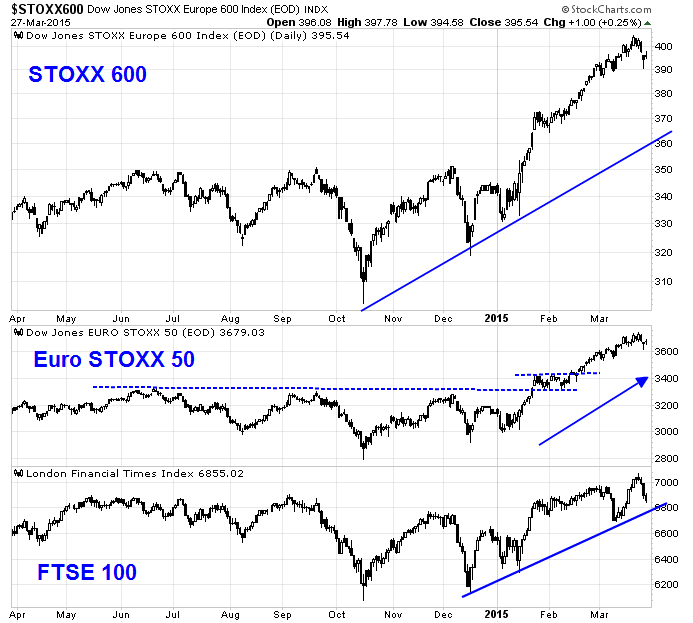 Across the Atlantic, the charts of European averages look constructive. 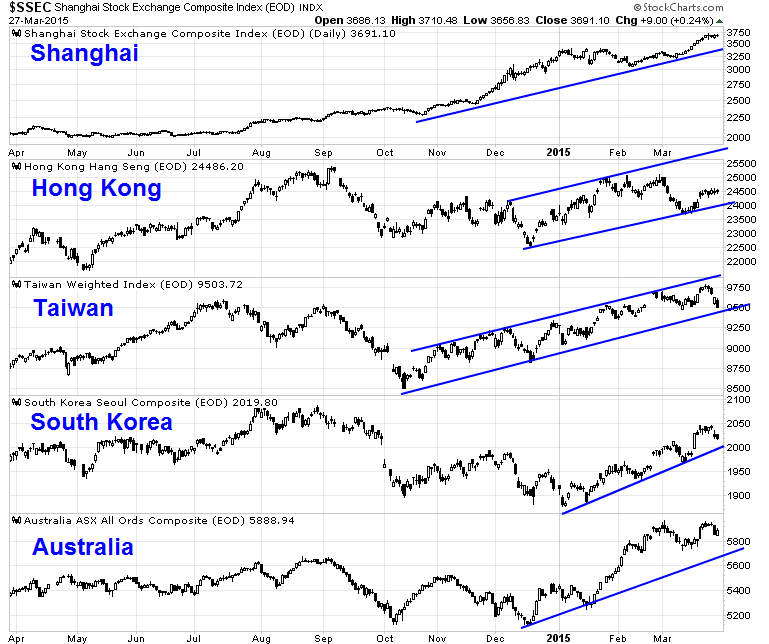 As well, the Greater China equity markets are in uptrends. Commodity markets are trying to rally, instead of showing signs of weakness. These are all indications of a growing global economy. 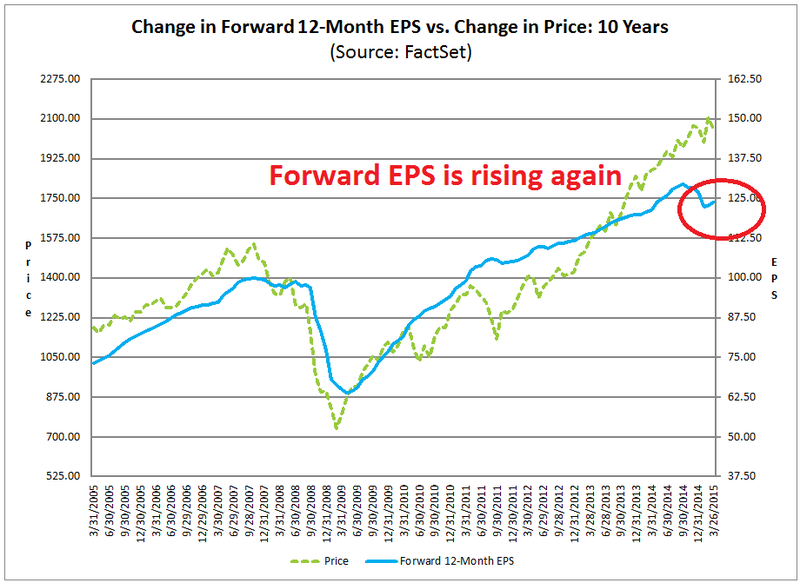 In the US, the latest update from John Butters of Factset shows that forward EPS is rising again, which is supportive of higher prices. It seems that the headwinds from falling oil prices and the rising USD are abating (annotations in red are mine). Despite the minor pullback we saw in equities last week, I am not seeing any signs of rising risk aversion. 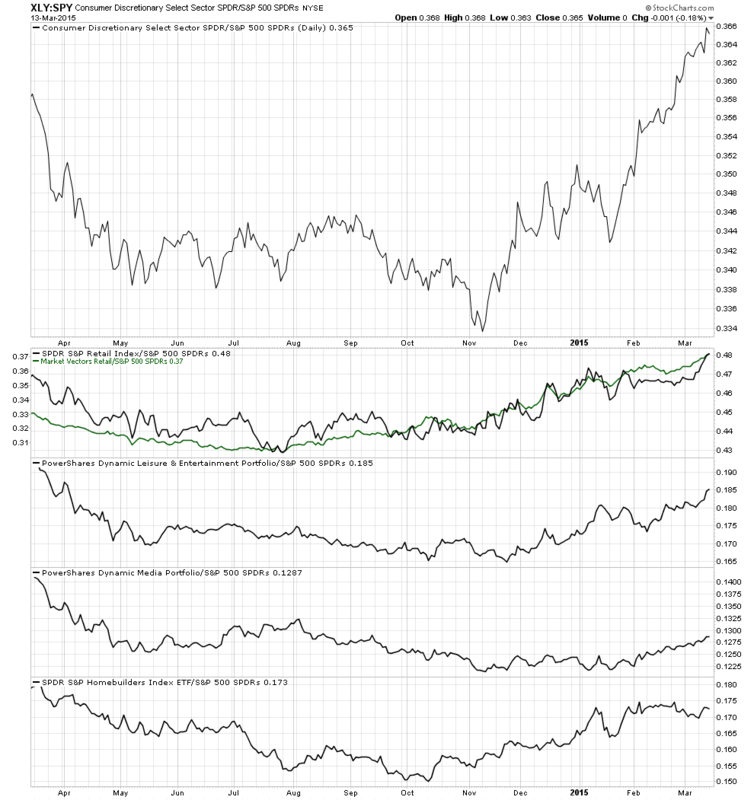 Consider, for example, this chart of the relative performance of HY bonds to Treasuries compared to the stock market. Even as stock prices fell, HY bonds actually outperformed, indicating rising risk appetite. A similar picture can be found in the relative performance of the high-beta, high octane and glamour groups of the stock market, such as biotech, internet, broker-dealers, IPOs and social media stocks. Does this look like a picture of an impending correction? In addition, small caps are outperforming large cap stocks. The pattern is evident not only in the US, but in Europe as well. When I put it all together, I can only conclude that the recent weakness is a hiccup. The intermediate term trend remains up. 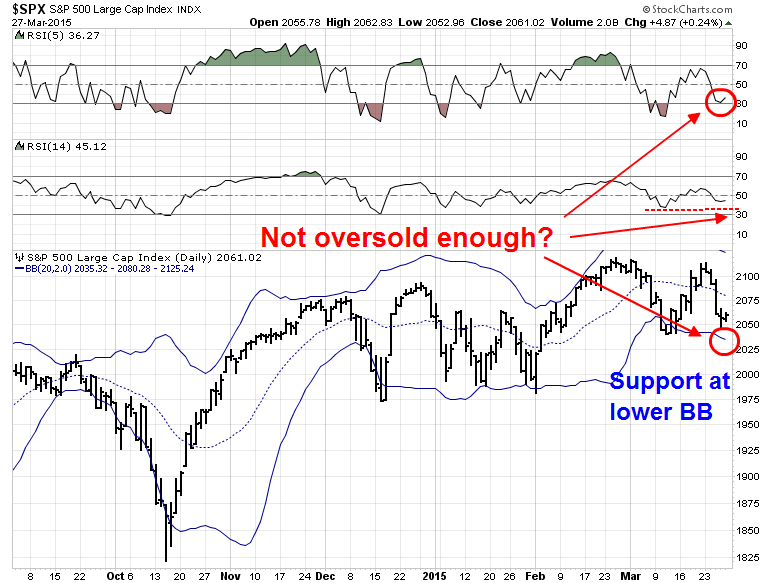 More weakness: Not oversold enough? Looking to the week ahead, however, I do have some concerns that the recent bout of weakness may not be over. While the stock market averages have softened, they have not pulled back enough to register extreme oversold readings that indicate a durable short-term bottom. As the chart below shows, the 5-day RSI, 14-day RSI are nearing oversold readings but there is room for them to fall a bit further. As well, the SPX has fallen to the lower Bollinger Band before reversing itself during recent episodes of market weakness. From a short-term technical viewpoint, I would have to allow for the possibility that stock prices weaken further next week. Downside risk for the SPX stands at about 2035, which is slightly more than 1% below the closing levels on Friday. The al-Houthis do not pose a major threat to Saudi Arabia; on the contrary, the rebels' control over north and central Yemen insulates Saudi Arabia from the chaos in other parts of the country and especially from al Qaeda in the Arabian Peninsula, which is a more immediate threat. The Saudis would rather have the al-Houthis on their southern border instead of a jihadist quasi-state that is hostile to them. While the Saudis would prefer not to have al-Houthi control of such a large piece of Yemen so close to their border, the situation seems to be the best outcome in a situation where all options are bad — as long as the al-Houthis do not start pushing northward. In fact, the United States has already indicated that it will work with the al-Houthis to fight jihadists in Yemen, another sign of the shift in the United States' position in the Middle East. Washington sees Iran, Hezbollah and even the Syrian government — except for President Bashar al Assad — as partners in the fight against the Islamic State, a development Saudi Arabia feels threatened by. The conflict in Yemen should therefore be seen as a minor geopolitical event and therefore pose little threat to stability in the region. So relax and pencil one in for the bulls. As well, Greece is going to to be in the headlines next week. Bloomberg provided a timetable of key events (link here) for Greece and Athens is scheduled to present a list of key reforms on Monday, March 30, in order to get more bailout funds. While events could easily spiral downwards for Greece, they could also go right too. Whatever the outcome, I believe that the market reaction is likely to be skewed to the upside. 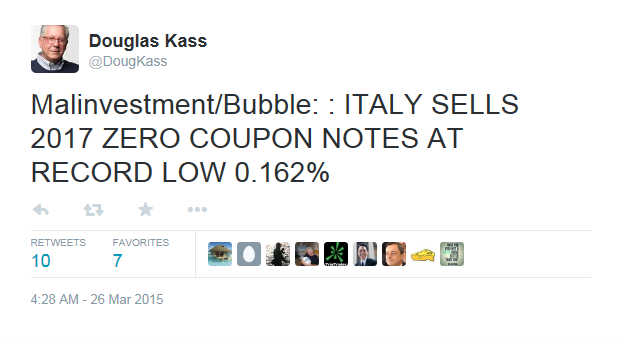 During the market sell-off last Thursday, Doug Kass tweeted the news that Italy had managed to sell 2017 zero-coupon paper for an incredible 0.162% yield. I interpret this as an indication that Greece has largely been firewalled. Any possible downside from a negative reaction to the Greek proposals is likely to be limited. On the other hand, the proposals could be accepted and we would likely see a risk-on rally. The bar to freeing up aid money is not very high. All the Greek government has to do is submit a list of a few reforms it will implement. After a couple of false starts, the Tspiras government appears to have down this before the weekend and is being reviewed. Fitch grew impatient and cut the country's rating from B to CCC just before the reforms were submitted. The list of reforms reportedly includes higher "sin taxes" on alcohol and tobacco. The tax on high incomes may be increased. There will be a greater effort to clamp down on tax evasion. Reducing the associated penalty is reportedly generating some positive results. News reports also indicate that Tspiras will also a primary budget surplus half of the 3% that the EU demanded. Pencil another one in for the bulls. Oil tumbled 5 percent on Friday, erasing the previous session's gains, as Yemen's conflict looked less likely to disrupt Middle East crude shipments and investors turned their focus to talks for a potential Iran nuclear deal that could put more supply on the market. Iran and six world powers have reached tentative agreement on key parts of a deal sharply curtailing Tehran's nuclear programme, Western diplomats said Sunday while cautioning that the pact is by no means done. One of these diplomats in talks in Switzerland said Iran had "more or less" agreed to slash the number of its centrifuge machines by more than two-thirds and to ship abroad most of its stockpile of nuclear material. As negotiators in Lausanne raced to nail down by midnight Tuesday the outlines of a deal, due to be finalised by June 30, the diplomats cautioned however that with some tough issues still to resolve, things may change. Iranian diplomats denied that any tentative agreement on these points has been struck, saying that reports of a specific number of centrifuges and exporting its stockpiles were "journalistic speculation". (Lightly) pencil a third in for the bulls. 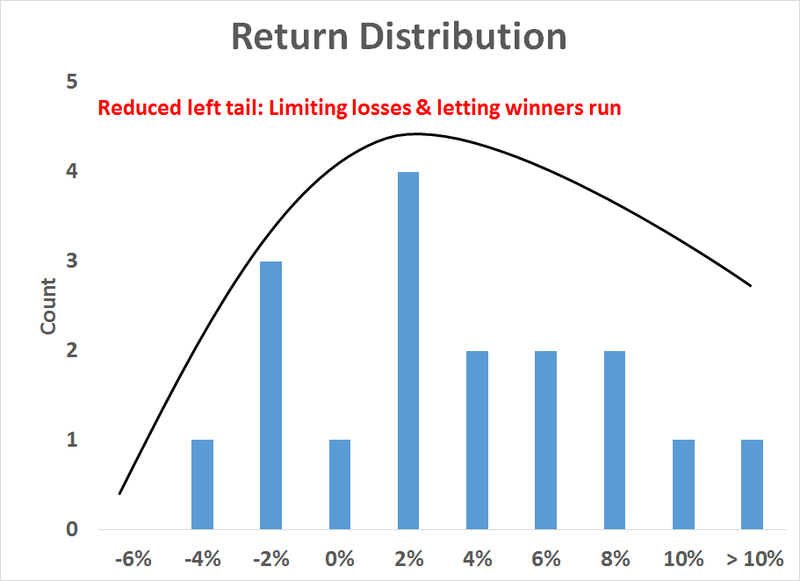 In short, there are a number of tail events with binary outcomes that could affect global markets in the near future. While I have no way of forecasting what will happen, the risk-reward ratio seems to be skewed to the upside. As I review market conditions, they can be summarized by an intermediate term bull trend, mildly (but possibly insufficient) oversold readings and event risk that is skewed to the upside. Bottom line: My inner investor remains bullishly positioned. My inner trader was caught offside by last week's decline and he is staying long despite the pain he endured. The risk-reward remains tilted positively with a long position rather than a short position. Here’s my take. When companies try to offer protection on credit or market capitalization, the process usually works for a while and then fails. It works for a while, because companies look best immediately after they receive a dollop of cash, whether via debt or equity. Things may not look so good after the cash is used, and expectations give way to reality. We saw this behavior in the late ’90s — people jumping to work at startups. As I often say, the lure of free money brings out the worst in people. In this case, finance imitates baseball: those that swing for the long ball get a disproportionate amount of strikeouts. This also tends to happen later in a speculative cycle. How worried should we about these signs? Last week, I wrote about how valuation didn`t seem to matter to the stock market until it mattered (see Cheap or expensive? The one thing about equity valuations that few talk about). During the expansion phase of an economic cycle, the main driver of stock prices are economic and earnings momentum. 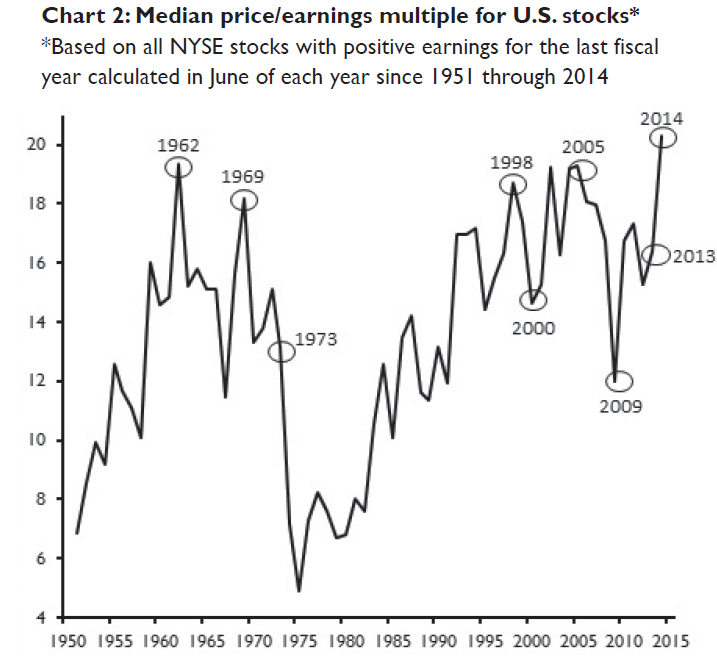 It is only during the recessionary part of the cycle that valuation puts a floor on stock prices. This framework is similar to the one voiced by David Rosenberg, who wrote that bear markets only occur because of recessions and Fed tightening cycles (via Business Insider). Well, sort of, I would generalize the cause of bear markets as recessions and Fed tightening causing recessions or creating recessionary fears. 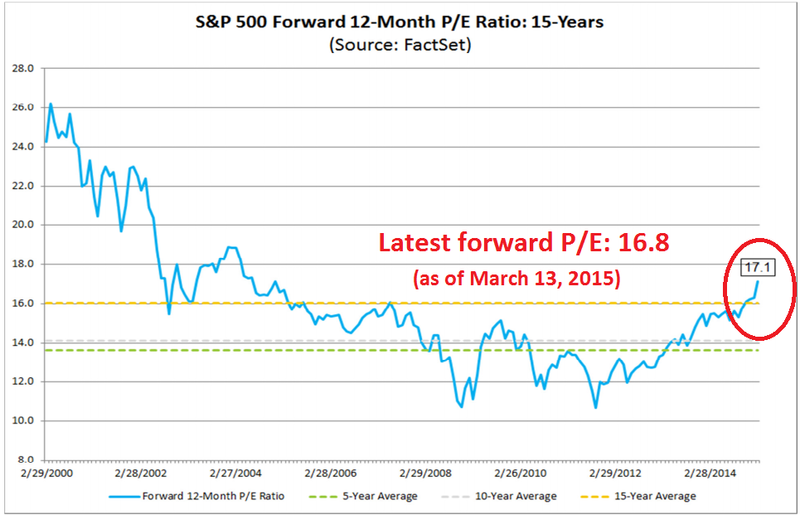 A long expansion is a persuasive argument for buying stocks even though forward P/Es are historically high. Investors are likely to be willing to pay more for stocks if they perceive that the economic expansion could last, let’s say, another four years rather than another two years. The more time we have before the next recession, the more time that earnings can grow to justify currently high valuations. If a recession is imminent, stocks should obviously be sold immediately, especially if they have historically high P/Es based on the erroneous assumption that the expansion’s longevity will be well above average. Bull markets don’t die of old age. They are killed by recessions. At this point, you may say, "Don't be an idiot, that's like saying buy stocks when they go up and sell them when they go down. Or 'Buy stocks when they go up, when they go down, don't buy them in the first place.'" How can you forecast a recession? The key issue is how we can tell if a recession is on the horizon. Already, the likes of David Merkel are warning about the appearance of speculative froth, which is a sign that we are nearing the top of the cycle. There are several deceptively simple approaches to watch for a recession. Doug Short has his Big Four Recessionary Indicators, which is a useful framework to use. New Deal democrat analyzes high frequency economic releases (his latest one is here). Neither is flashing recessionary signals at the moment. While those kinds of approaches have great value and I use their output to supplement my model results, I find them unsatisfying. That's because you are using coincidental or lagging indicators to forecast a leading indicator. Economic statistics, which get released with a time lag (and may be a coincidental or lagging indicator). On the other hand, stock prices represent a leading indicator. This has been the Achilles Heel of macro forecasting, using economic statistics (which are released with a lag) to forecast stock and bond prices (which are forward looking) will inevitably cause you to miss the early warning signs of a recession. Economic signals about expansion and contraction are persistent. Once an economy start to lose steam and roll over into recession, it will continue to do so until the fiscal and monetary authorities react (with a long lag). 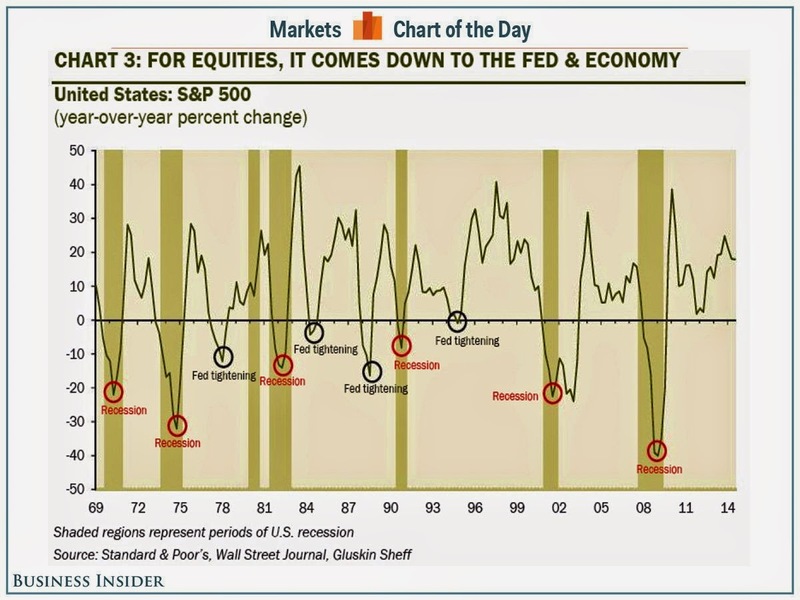 That`s why Doug Short`s Big Four Recessionary Indicators work in forecasting recessions. These kinds of indicators just operate with a lag and you will be long stocks as the economy rolls over. The US economy is an important part of the global economy. US recessions therefore will not occur in isolation, but we will see feedback loops with other parts of the global economy. There are three major trade blocs in the world: US, Europe and Asia (China). Watching what happens with these three major economies will give you more or less everything you need to know about where the global economy is going. Note that they may not all expand or contract in a synchronized way, however. That`s why I am a technician. It`s not that I believe that there is anything magic about technical analysis. They just happen to be the right tool to use in the current situation. In particular, commodities can tell us a lot about how global demand is changing at the margin. In the last decade or so, they have been more about Chinese demand as China has become the major user of commodities. Recognizing that the regional economies of the three major trade blocs are not always synchronized, give each of the components of the trend following model signals votes and let them tell you whether the world is in expansion or contraction. For investors, buy stocks when the global economy is in expansion, sell (or reduce) stock positions when they are moving into contraction. For traders, watch for direction of the change of the signal. If the signal gets better, buy stocks. If the signal gets worse, sell stocks. In short, that has been the basis for my Trend Model. The proof is in the pudding and I have been running an account based on the trading signals of that model since September 2013. The latest report card can be found here. The chart below shows the history of the actual (not backtested) buy (dark blue arrows) and sell (red arrows) signals of the trading model. The superior diversification effects of the strategy, as returns were negatively correlated to both stocks and bonds. I would caution, however, that the this strategy has been benefiting from a friendly market environment for trend following models. The US equity market has more or less gone up in a straight line in this period. 2015 is likely to see a choppier market and that`s when this model will get an acid test. In that environment, I would expect that drawdowns will occur more often and be larger, which will lead to deterioration in average returns and the monthly batting average. I am highly encouraged by these results and I will be monitoring and reporting on the results in the future. Disclaimer: This blog post is for discussion only and I am not trying to sell anyone anything. I am not currently in a position to manage anyone`s money based on the investment strategy that I am describing. No offering will be done without the proper regulatory filings. This post will be somewhat shorter than usual, mainly because I feel like I am reiterating many of my comments from the last few weeks. Since mid-February, I have been using 2011 as a rough roadmap for the behavior of the equity market, largely because of the parallels with Greece. I believed that the market would see a series of choppy up and down moves and the pattern would resolve itself with a bullish trend as the political and financial difficulties resolved themselves (see 2011 all over again?). 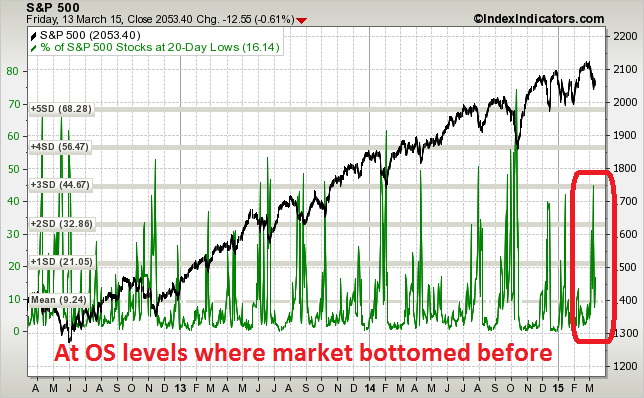 As shown by the 2011 chart of the SPX below, the 2011 market was saw much up and down choppy action, which moved the market to an oversold reading on the 5-day RSI (blue vertical lines). It then staged an upside breakout, consolidated sideways and then pulled back below the breakout level. It finally resolved itself by staging a sustained rally after the pullback test (red vertical line). 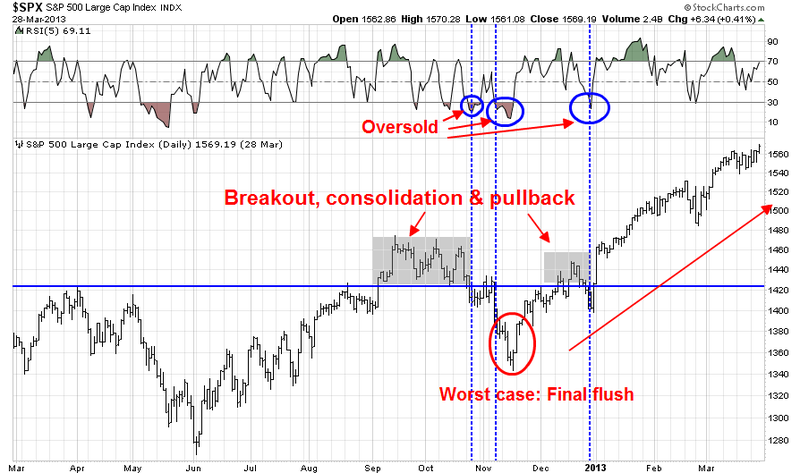 The market in 2012 also saw a similar breakout, consolidation and pullback episode. Note the instances of short-term oversold readings marked by the vertical lines. In some cases, the market rebounded right away. In another, it required a final flush before seeing a durable bottom. 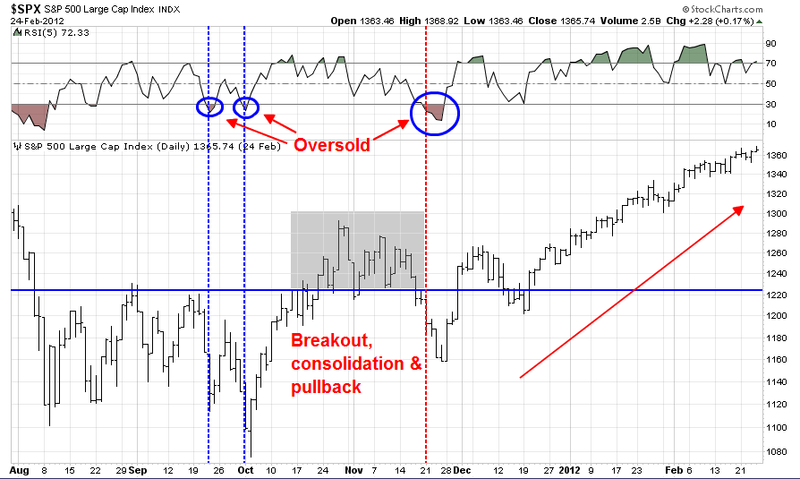 The breakout-pullback-breakout patterns from 2011 and 2012 appear to be repeating themselves today, which is bullish. 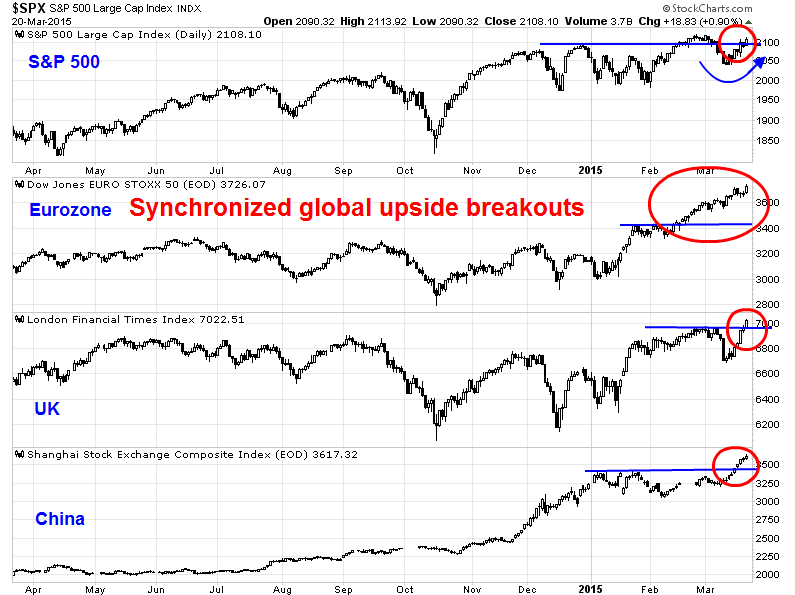 Further support of the bull case can be seen in synchronized global upside breakouts in major equity market indices. We are seeing upside breakouts in the FTSE 100, a continued uptrend in the Euro STOXX 50 and an upside breakout in the Shanghai Composite. The US market, as measured by the SPX, is somewhat of a laggard in that sense as it has only staged an upside breakout of the old resistance level at about 2093 and it has not tested its all-time highs yet. This kind of across the board global momentum is very bullish. A closer examination of the SPX shows that this index has more room to rally. Neither the 5-day RSI (top panel), which is useful for short-term trading, the 14-day RSI (second panel), which is more useful for spotting intermediate term tops and bottoms, are overbought. Moreover, these indicators are exhibiting positive momentum, which is are confirmations of recent strength. 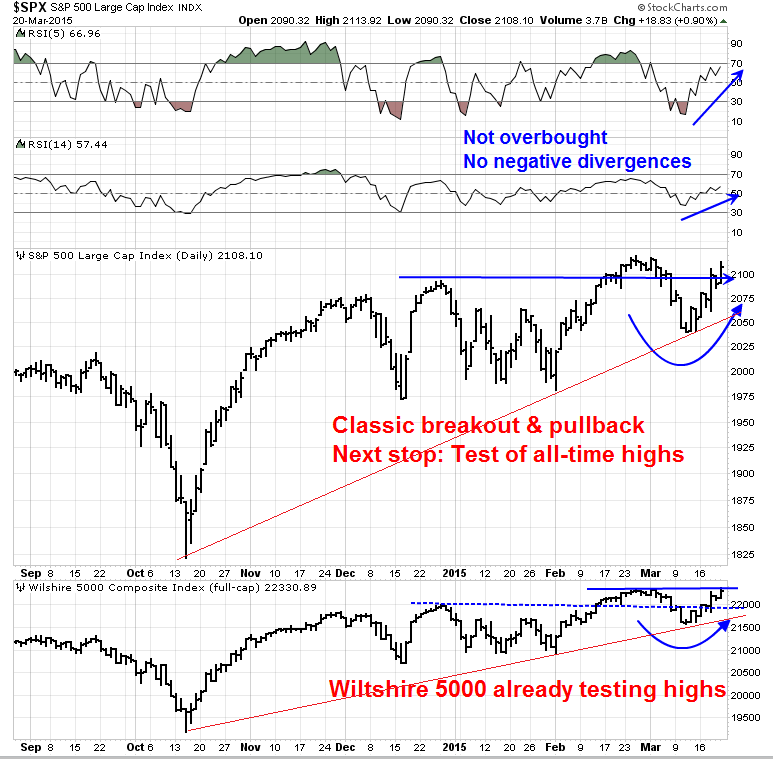 The SPX, which remains in an uptrend, is also exhibiting a classic breakout-pullback-breakout pattern and the index has rallied above the breakout point as a sign of market strength. Moreover, the more broadly based Wiltshire 5000 also displays the breakout and pullback pattern and moved to test its old highs on Friday. I have written before that current conditions suggest that the economy is in the mid-cycle phase of an expansion and my views are unchanged (see 4 reasons why this is not a market top), namely. Fundamental momentum is positive. 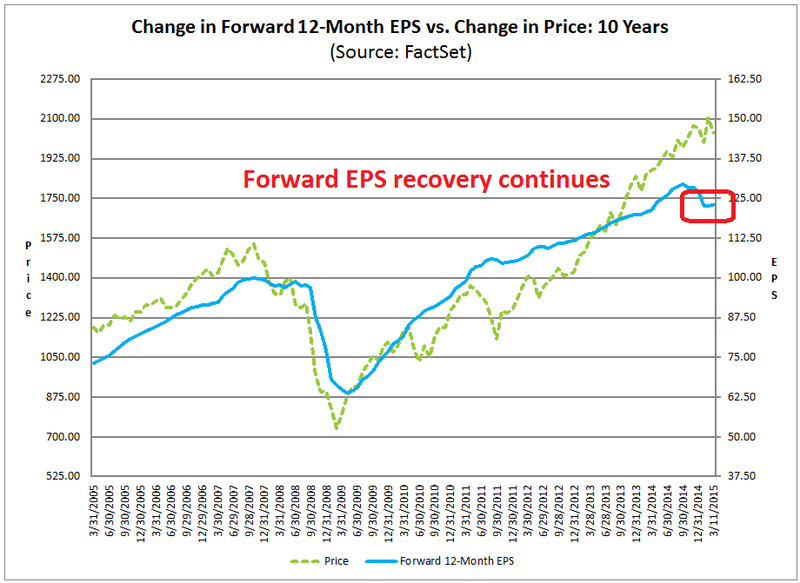 Forward EPS estimates have stopped falling and they have started to climb again. 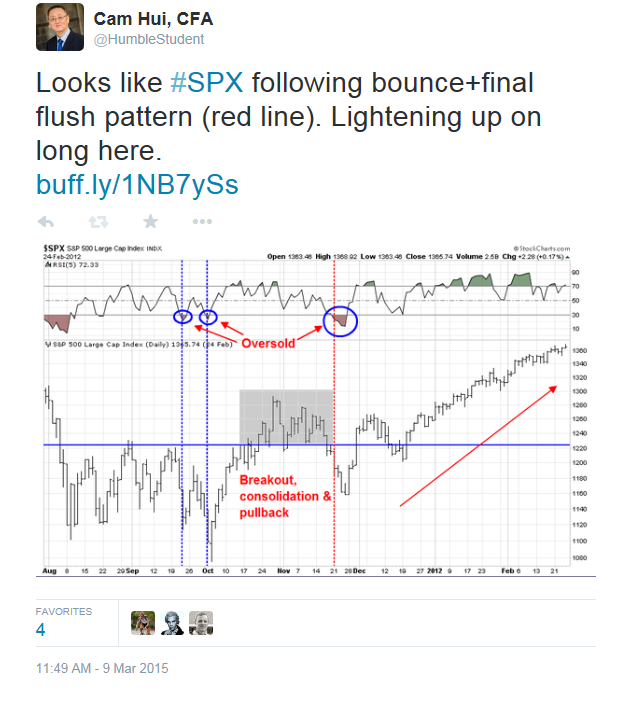 The latest update from John Butters of Factset confirms the trend that began several weeks ago. As well, this week's monitor of high frequency economic releases from New Deal democrat also shows that the recent economic weakness seen so far seems to be abating. 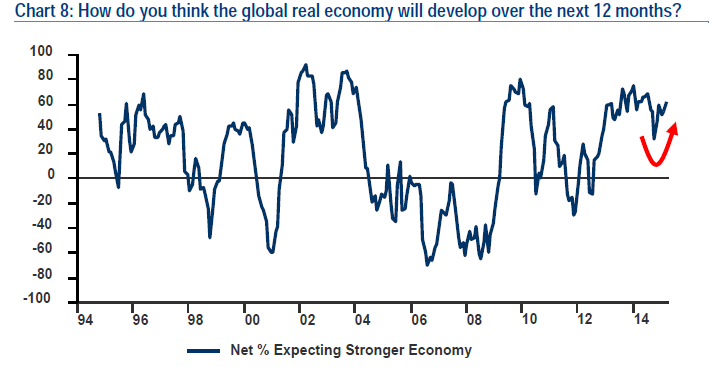 The latest BoAML Fund Manager Survey (FMS) shows that global growth expectations continue to turn up. Market leadership points to continued economic growth. A study of sector leadership last week indicated that the market leaders consist of Health Care, NASDAQ and Consumer Discretionary stocks. 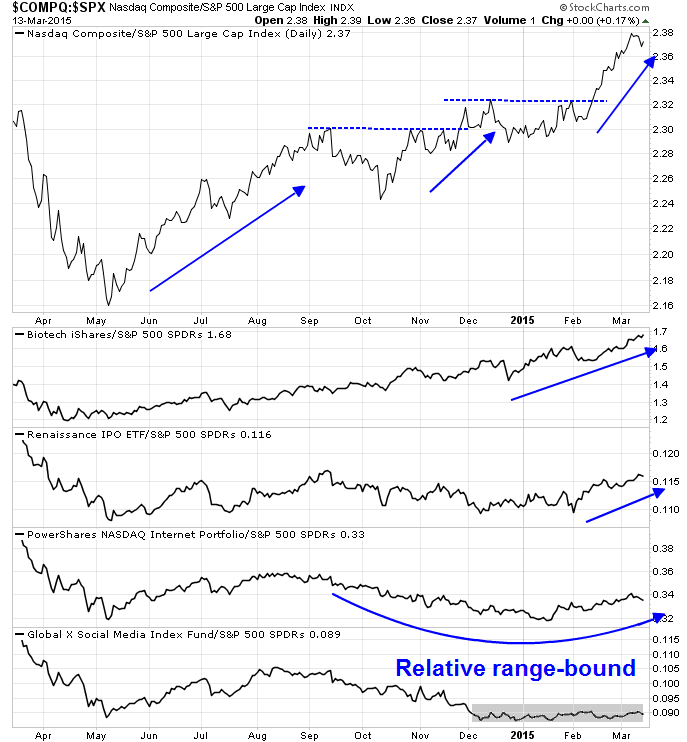 Defensive sectors such as Consumer Staples and Utilities have been lagging. This is the picture of an economy in the mid-cycle phase of an expansion. Another bullish factor can be found in the sentiment data. 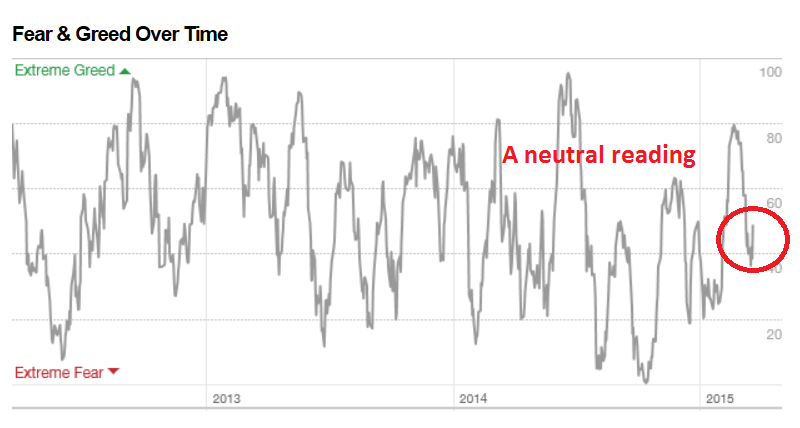 Despite some of my reservations about the construction of the index, the CNN Money Fear and Greed Index is in dead neutral, indicating that sentiment is nowhere near a crowded long reading, which implies that stock prices have further room to run. The latest FMS also shows that cash allocations are still a bit on the high side relative to its own history, which suggests that institutional managers could potentially put more money to work in equities. Take a look at this chart of the relative performance of US stocks compared to the MSCI All-Country World Index. 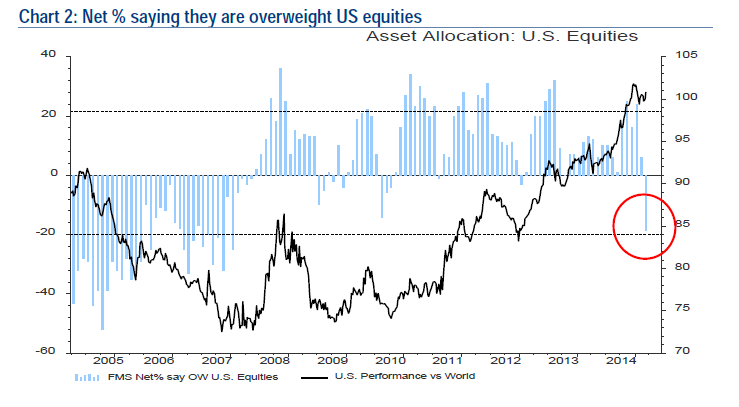 There are three major reasons to be overweight the US equity market. First, it remains in a relative uptrend compared to global stocks. It got ahead of itself in late December and early January and has since retreated from those excesses. 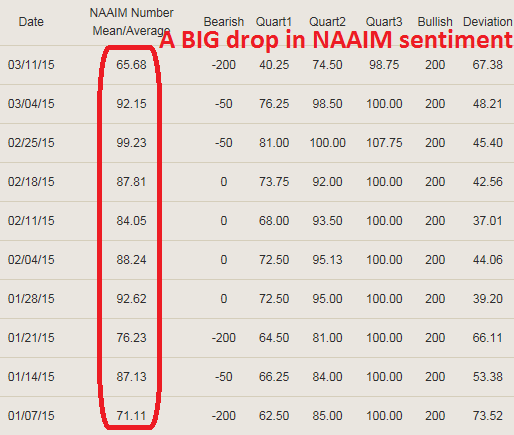 Finally, sentiment readings (see above FMS chart) is tilted bearish, which is contrarian bullish. In conclusion, I haven't seen such unambiguously bullish readings in such a long time. I suppose that as we get closer to a Fed liftoff on interest rates later this year, US equities could get the jitters and pull back. For now, the path of least resistance for stock prices is up. My inner investor continues to be overweight stocks. My inner trader is also long, but he is closely watching sentiment and momentum indicators should the SPX test its highs next week, which it will likely do. The market may become short-term overbought at that point and it may be prudent to trim back some long positions, but I don't want to be anticipating model readings. I will be updating any developments on my Twitter account @humblestudent during the week. I got a lot of feedback from my post last week on the effects of Chinese capital flight on the Vancouver property market (see Behold the tsunami of liquidity from China). While there were a few locals who had comments about the local real estate market, the majority of comments had to do with the risk of a RMB devaluation. It seems that the issue of a CNY devaluation is a hot topic these days. Let me make this clear from the beginning. When I refer to a Chinese devaluation, I don't mean run of the mill operations like a RRR or interest rate cut, but a massive shock-and-awe effort like a QE program or an explicit announcement to widen the allowable CNY trading band. Such moves would send massive shockwaves around the financial world. The pressure is on Chinese exports as the euro sinks against the yuan, Ministry of Commerce spokesman Shen Danyang said on Tuesday. The yuan was up 10.8 percent against the euro until March 13, when the euro devalued 13.2 percent against the U.S. dollar. The price advantages of Chinese exports to the European market has been softened by the euro devaluation, said the spokesman. The weak euro will also incite eurozone exports to other markets, adding competitive pressure to China's high value-added exports. The WSJ rhetorically asked, "Will China Break the Currency Truce?" In the past five years, first the dollar, then the yen, and now the euro have tumbled as their respective central banks have undertaken large-scale bond-buying, or “quantitative easing” (QE). This is not a zero-sum currency war: QE sends money cascading across borders, bolstering asset markets and often triggering reciprocal monetary easing. Everyone wins. But it’s a different matter if China devalues; that would kick off a currency war. That's because a Chinese devaluation would amount to the detonation of a financial WMD, aimed at the heart of the economies of its major trading partners. China is different because, even after significantly liberalizing its financial system, it still maintains controls over how much money can move in and out. When interest rates rise or fall, foreigners and residents can’t respond by moving money at will in and out of China, except surreptitiously. A repressed financial system means China has multiple tools for multiple targets: interest rates and credit guidance to target investment; reserve requirements to target bank liquidity; and the yuan to target trade. This means that when China’s currency falls, its trading partners don’t get the usual benefits of easy monetary policy; there is no outrush of capital from China to other countries, and no boost to domestic spending to bolster imports. That is why a move by China to devalue would arouse much more tension with its trading partners than the QE-driven devaluations by the U.S., Japan and eurozone. Whether that will happen is a matter of fierce debate. 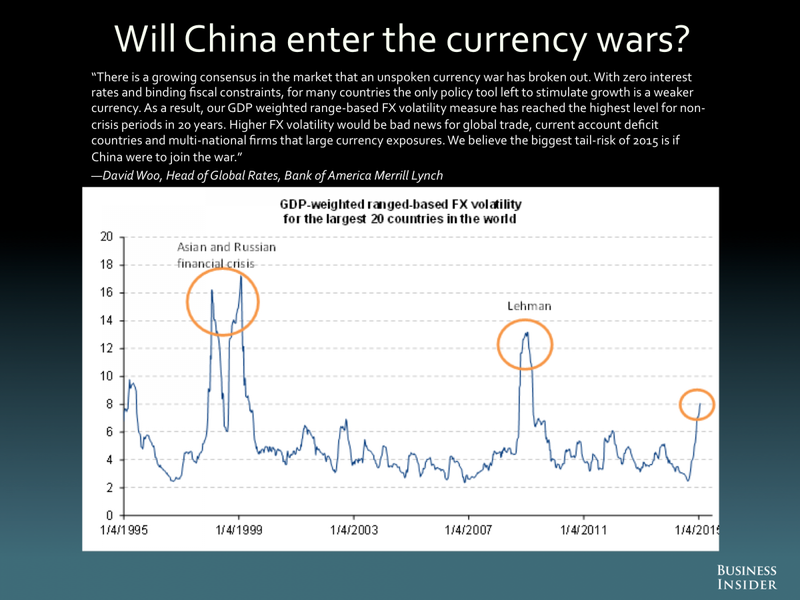 In my previous post, I highlighted the analysis by David Woo of BoAML about a potential currency war and FX volatility (via Business Insider). Such volatility episodes have been associated with market turmoil in the past. As the chart shows, the effects of a RMB devaluation would indeed look like a financial WMD. How likely is a Chinese devaluation? If I were a goldbug, or if I wrote for Zero Hedge, I would stop right here. The tail-risks are obvious and, while we have no way of knowing when Beijing devalue, disaster is just around the corner. A more intelligent analyst might try to ascertain if China did possess such financial WMDs and, if they do, what the likelihood that the PBoC might use it. Staying with the WMD analogy for the moment, suppose that you were an intelligence analyst and your job is to figure out if a certain country had WMDs. What would you do? Modern military organizations are bureaucracies (as are finance ministries and central banks). ABC (Atomic-Biological-Chemical) warheads are volatile and difficult to handle. Moreover, their use can carry enormous political risk. The last thing you want is for some rogue officer to drag your country into a war you didn't start by firing off one of these weapons. Therefore the standard procedure is to create policies and procedures for the storage and release of these ABC weapons. Typically, one group of troops guard and store the warheads; and another delivers them. As an example, I once spoke to a former Canadian Starfighter pilot who was stationed in Germany in the 1960s. He was part of a Starfighter squadron whose mission was to drop nuclear warheads on the advancing Soviet forces should war break out. The aircraft (delivery vehicle) was under Canadian control, but the warheads were under American control. Part of the procedure was the plane would sit, with the nuclear bomb attached, on alert on the tarmac. One of the key failsafe procedures was that the Canadian pilot had to sit in the cockpit with the canopy open with both hands visible at all times holding the side of the fuselage. An armed American guard stood nearby, with orders to shoot the pilot should he move his hands inside the cockpit. Who would get hurt should China devalue? In the same spirit, we can look for possible policies and procedures that the PBoC may undertake should they decide to devalue the RMB. We know that there are lots of reasons why Beijing might want to devalue, but there would be considerable damage done too, both to their economy and the economies of their trading partners. While the PBoC might not care about White People getting hurt, nor would they care very much about the Japanese, Koreans, Singaporeans and so on, they would care about the pain suffered in Hong Kong and by Mainland Chinese companies. Hong Kong began the Lunar New Year with its chief executive imploring the population to be more like sheep. But investors should watch where they are being led: As currency wars threaten to engulf its giant neighbor and spur it to devalue the yuan, Hong Kong looks highly exposed. Attention in recent weeks has focused on the possibility of yuan depreciation as China’s economy slows and as it suffers capital outflows. It is worth considering the fallout for Hong Kong under such a scenario, given the extent to which its economy has become dependent on the supercharged stimulus of an artificially suppressed currency. Analysts have been sounding the alarm over the growth of a huge “invisible carry trade” of lending into the Chinese mainland in recent years. As China’s currency appreciated, borrowing in Hong Kong dollars became extremely popular, not only because of the much lower interest rates than on the mainland but also due to the attraction of taking out a liability in a depreciating currency. The kicker would come from sticking this money into high-yielding shadow-banking products. Brokerage Jefferies was flagging this a year ago, describing an almost parabolic increase in lending to mainland China. Bank of America echoes such concerns in a recent report, detailing how lending exposure has reached 160% of Hong Kong’s entire gross domestic product, up from 20% in 2006. It cautions that instability and imbalances can be caused by currencies that have been on a predictable, stable trajectory, fomenting the belief that the trend will be permanent. U.S. dollar-denominated borrowing by companies in Asia was fueled in recent years by lower interest rates and abundant liquidity offshore. Now, as the Federal Reserve prepares to raise interest rates and the greenback strengthens, heavily indebted companies face the prospect of higher repayments. Dollar credit to Chinese borrowers has reached $1.1 trillion, the BIS said in a January report. Asia’s largest economy has the world’s biggest corporate liabilities that Standard and Poor’s estimates stood at $14.2 trillion in 2013. In another words, there has been an enormous “invisible carry trade” where Mainland Chinese companies either borrow in HKD or USD in Hong Kong at lower interest rates, move the funds back into China and invest the proceeds into shadow banking products at mid to high single digit interest rates. A simple devaluation would blow an enormous financial hole in the Chinese financial system as the value of those liabilities skyrocketed. Moreover, it would crater the Hong Kong financial system, as the lending exposure of 160% of GDP is comparable to the exposure of Cypriot banks at the start of their financial crisis. If China were to devalue, it desperately needs to insulate both Hong Kong and their domestic companies from the worst effects of the coming storm. One of the key telltale signs of impending RMB devaluation would be the announcement of closer ties, cooperation, or coordination between the PBoC and the HKMA. Another telltale sign might be steps that Beijing takes to insulate Mainland companies from their USD 1.1 trillion debt, such as the establishment of dollar swap lines with the Federal Reserve. More than half of the high-interest local government debt that falls due this year will be covered under a debt swap plan arranged by the Ministry of Finance, which said on Friday that the swap would not raise the debt level further. The ministry on Monday disclosed that it had ordered issues of 1 trillion yuan ($160 billion) of low-yield municipal notes that will replace legacy liabilities, in a bid to ease local governments' mounting interest repayment pressure. An audit in June 2013 found local governments faced repayments of 1.858 trillion yuan in 2015. The debt swap covers 53.8 percent of that amount, and the conversion could reduce interest payments by 40 billion yuan to 50 billion yuan a year, according to the ministry. Arguably, the formation of the Asian Infrastructure Investment Bank (AIIB) lays the groundwork for mitigating potential damage from a Chinese devaluation. The participation of major US allies such as the UK, France, Germany and Italy, in the AIIB are positive steps in the globalization of this initiative. In addition, countries like Australia, Switzerland and South Korea have expressed interest. However, the AIIB must be regarded as a long-term project and it would not be in a position to mitigate damage should the PBoC take steps to devalue in the immediate future. In summary, just as the military intelligence analyst looks for signs that another country has WMDs, or is preparing to use them, the investment analyst can look for similar signs of central bank or finance ministry policy. For now, I see little evidence of the sequencing of steps which indicate that the PBoC is getting ready to devalue the RMB in a massive way. While I recognize that pressure is building, the doomsters can rest easy - at least for now. Let’s take a look at the valuation of U.S. markets. This is relevant to investors, as valuation determines future expected returns. Thou shalt focus on the very best measure of market valuation, according to academic research and data. These should have the force of moral law for anyone who wants to understand whether stocks are cheap or expensive. BCA Research, who focuses mainly on forward PE to reach their conclusion. James Paulsen at Wells Capital Management, who studied median PE and PB ratios within the SP 500 and concluded valuations are stretched. Meb Faber, who pointed to the history of the Price to Sales ratio, as well as various versions of PE10. Shane Leonard, who has railed about the nosebleed valuations of Silicon Valley start-ups. Also see the Fortune article by Bill Gurley predicting 'dead unicorns' in start-up land. Philosophical Economics, who developed a new Total Return EPS Index, based on the assumption that companies did not pay dividends but engaged in share buybacks instead. Based on that metric, he came to a SPX target of about 2150.in 2020, indicating stretched valuations. 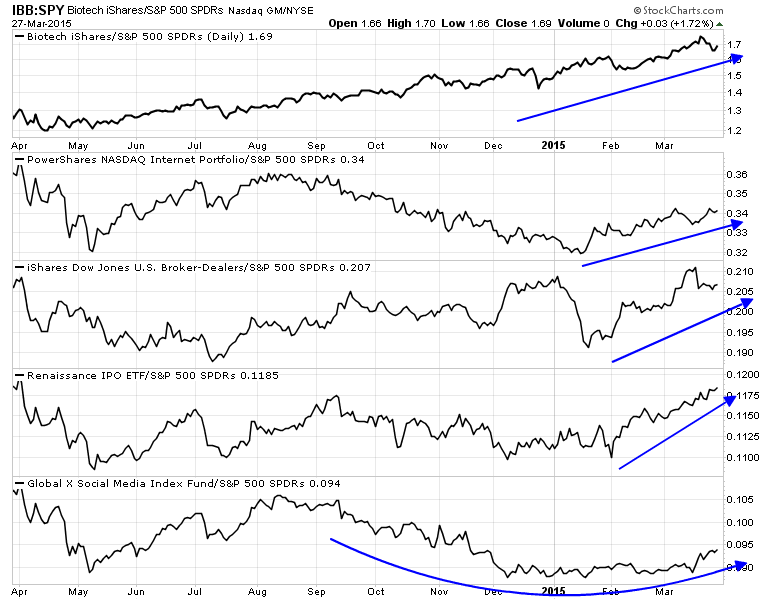 Despite the warnings about how expensive equities are, stock prices have continued to advance. That's because, for investors and traders with relatively short (1-3 year) time horizons, valuations have a habit of not mattering until they matter. Using shorter term time frames, what matters more to stock prices is macro-economic and earnings momentum. Macro Man recently created a simple model that regressed retail sales, industrial production and durable goods, ex-transportation, to the stock market. The fit is remarkably good. This wasn't meant to be a rigorous study and we can argue about the problems of data co-linearity, backtesting and data fitting. Nevertheless, he made the point that stock prices respond to macro signals about growth. Regular readers also know that I have regularly monitored Factset for the evolution of forward 12 month EPS, which, incidentally, have begun to slowly rise again after suffering a large decline (mainly due to the negative effects of falling energy prices). High valuations lead to large stock market declines during recessions. 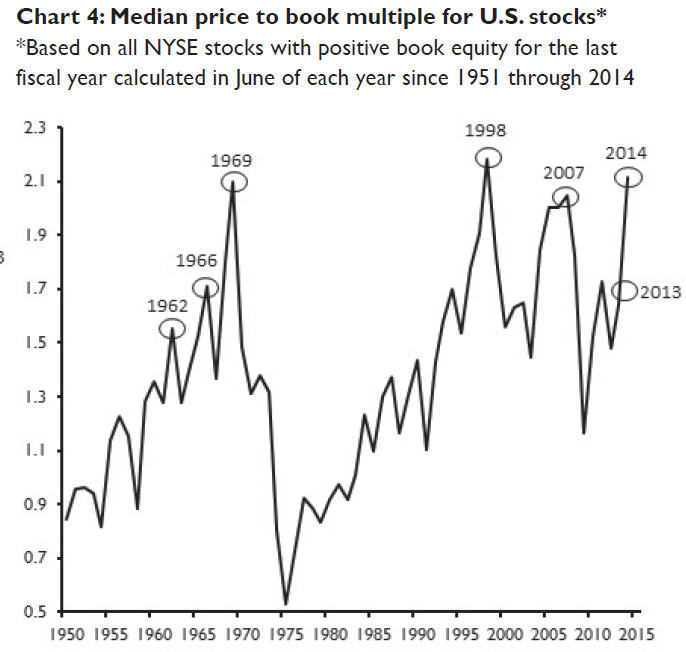 During secular bull markets, modest overvaluation does not produce large stock market declines. During secular bear markets, modest overvaluation still produces large stock market declines. Here is a table that highlights some of the key points. The rows are sorted by the valuation column. The SP 500 is likely to decline severely during the next recession, and future index returns over the next 7 to 10 years are likely to be low. Given this scenario, over the next 7 to 10 years a buy and hold strategy may not meet the return assumptions that many investors have for their portfolio. Asset allocation in general and tactical asset allocation specifically are going to be THE important determinant of portfolio return during this time frame. Just buying and holding the SP 500 is likely be disappointing. Some market commentators argue that high long-term valuations (e.g., Shiller's CAPE) no longer matter because accounting standards have changed and the stock market is still going up. However, the impact of elevated valuations -- when it really matters -- is expressed when the business cycle peaks and the next recession rolls around. Elevated valuations do not take a toll on portfolios so long as the economy is in expansion. I have two key conclusions from this analysis. Yes, valuations do matter - but only for investors trying to project returns as part of an investment plan and policy. For investors with shorter time horizons, you should only be watching for signs of recession. Equities appear to be expensive right now, but don't worry as there is no sign of a recession on the horizon. That's why it is important to pay attention to Doug Short's Big Four Recession Indicators, whose signals remain benign for the moment. For investors with long time horizons who have formed an investment policy, ugly bear markets are not necessarily disasters. If the account is taxable, bear markets can be welcome periods to re-balance an equity portfolio in a tax-effective manner. You can harvest capital losses and match them against positions with large capital gains in order to free up some cash to look for better investment opportunities. As well, bear markets are opportunities to better re-invest income and dividends at much lower prices. That's why people like Warren Buffett do not fear them. 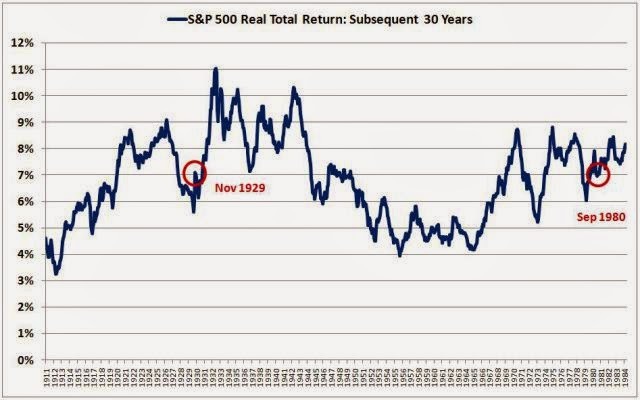 Philosophical Economics pointed out that an investor with a 30 year time horizon actually had better returns by investing in November 1929, the month after the market crash, than in September 1980. When valuations are low, focus on growth and low yielding stocks to more effectively take advantage of capital appreciation. A recent post by A Wealth of Common Sense shows that it can be very profitable to invest during recessions. Long term investors should be hoping that they get a few and to have the resource available to enhance their returns during such periods. Last week, I wrote that the SPX was tactically oversold on the 5-day RSI and could be due for a bounce. We saw a weak rally on Monday, which I interpreted in a tweet to a weak bounce and believed that a final sell-off was in order. At the close on Tuesday, I wrote that the it appeared that we were getting close to a capitulation bottom (see Getting close to a ST market bottom) and confirmed my beliefs in a tweet at the close on Thursday. However, instead of the bulls delivering a follow-through rally as they have done in the past rallies off V-shaped bottoms, the markets instead saw a Friday the 13th surprise sell-off. The bull trend was saved by a bounce off the uptrend line that began last October. In fact, a review of the charts, both within the US and globally, indicate that the bull trend is still intact. 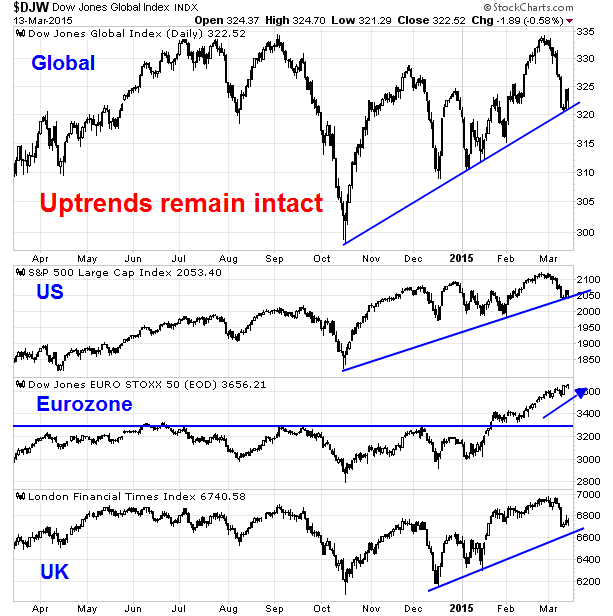 The chart below of global, US and European equity averages show a pattern of a pullback to successfully test the uptrend. In the meantime, the market is getting oversold and sentiment readings are turning bearish, which is contrarian bullish. 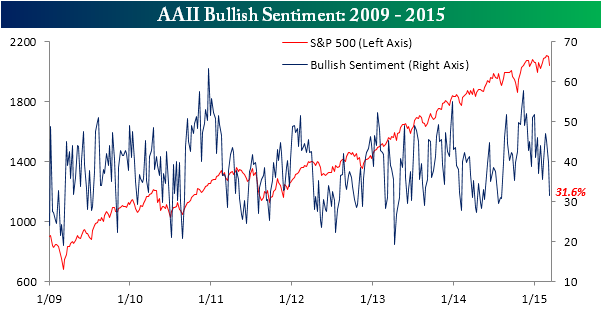 Bespoke reports that AAII bullish sentiment has dropped like a rock, though bearish readings have not risen as the (former) bulls turned neutral. You get the idea. While I believe that stocks are poised to rally, we have a wildcard in the form of the FOMC meeting next week, which could create further asset price volatility. Sentiment has become so negative that any hint of good news may create a melt-up in the price of risky assets. As an example, the much better than expected Employment Report on March 6 swung psychology to a June Fed rate hike, but inflation and inflationary expectations remain tame (see Why the Fed may stay "patient" for a little longer). While the FOMC may drop the word "patient" in its March statement, the possibility that it could be replaced by some equally dovish language under the circumstances. The GDPNow model forecast for real GDP growth (seasonally adjusted annual rate) in the first quarter of 2015 was 0.6 percent on March 12, down from 1.2 percent on March 6. The nowcast for first-quarter real consumption growth fell from 2.9 percent to 2.2 percent following this morning's retail sales release from the U.S. Census Bureau. Negative coincident indicators have generally abated, with the big exception of Steel. The short leading indicators also returned to generally positive readings. Oil prices fell back to their January low. Industrial metal prices rose slightly, but were still close to their recent low. Spreads between corporate bonds and treasuries improved slightly and I scoring them a slightly positive. Temporary staffing also returned to being positive. Gas prices and usage remained positive, and initial jobless claims improved within their positive range. As indicated above, coincident readings largely abated from being quite negative. Rail, which had been awful, was mixed. Consumer spending as measured by Gallup was just barely positive yet for the first time in weeks, while Johnson Redbook was again only weakly positive. The TED spread and LIBOR have leveled off as barely negative. Shipping turned more positive, and tax withholding was positive as well. Only steel production was negative, and in a big way. Last week the weakness in the high frequency data spread from coincident to short leading indicators. I remained positive, since this is not the order in which I would expect the economy to turn. This week's data bears that out. In particular I said, "I will be paying particular attention to rail and to Gallup consumer spending to see if they turn positive in the next several weeks, and to see if the temporary staffing downturn was just one week of noise." This week all three were positive. I think there is a lot of bad news in the current 2015 earnings forecasts and numbers. I think the dollar is as much of an issue maybe more than Energy at this point, since it is tougher to quantify. Personally, despite the worries about the forward growth rate of the SP 500 earnings estimate going negative, I dont think we are anywhere close to a 2008-type scenario in the stock market. Despite the headline to this weekend’s update, I’m not that worried about SP 500 earnings. Even if the dollar were just stable for a month, and the euro stopped plummeting, I think that could take some pressure off estimates. Should a dovish Fed statement next week send the USD lower, it would precisely set up that kind of market psychology where USD weakness translates to greater EPS growth optimism. Further, a review of stock market sector and industry leadership is highly suggestive that this is not an intermediate term market top. Typically, topping patterns are preceded by the relative deterioration of high-beta glamour groups and the outperformance of defensive sectors. 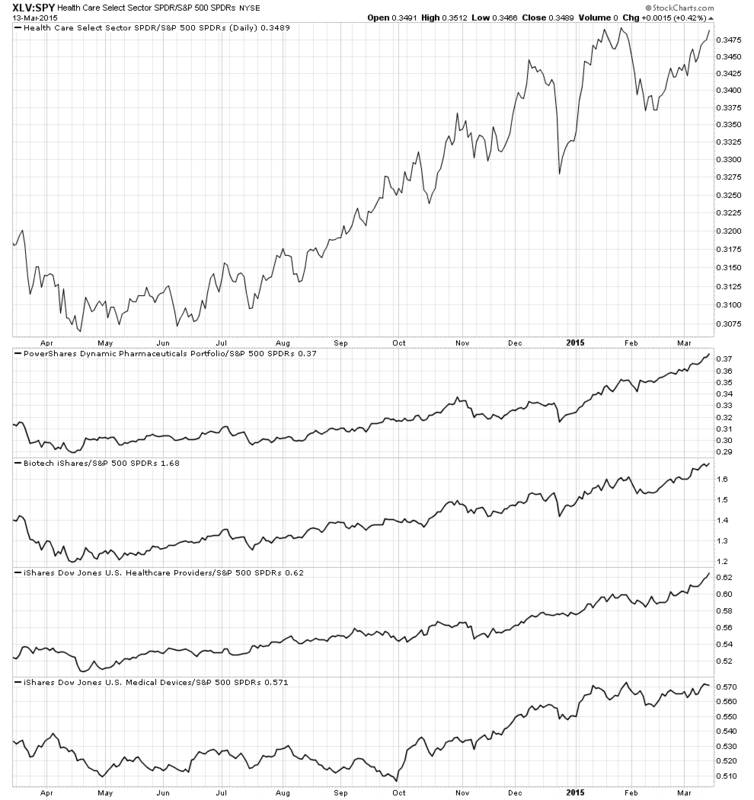 Here is a chart of the relative performance of two major defensive sectors. Are they beating the market? Tops normally don't start this way. When I put it all together, the big picture tells a story of some short-term weakness in the context of intermediate term strength. Expectations have been beaten down and crowded short positions are being formed. On the other hand, there is little sign of intermediate term weakness, either from a technical or fundamental perspective. This doesnt mean that stocks will go up in a straight line, as the market reaction to the FOMC meeting is unpredicatable. However, I believe that downside risk is relatively limited. 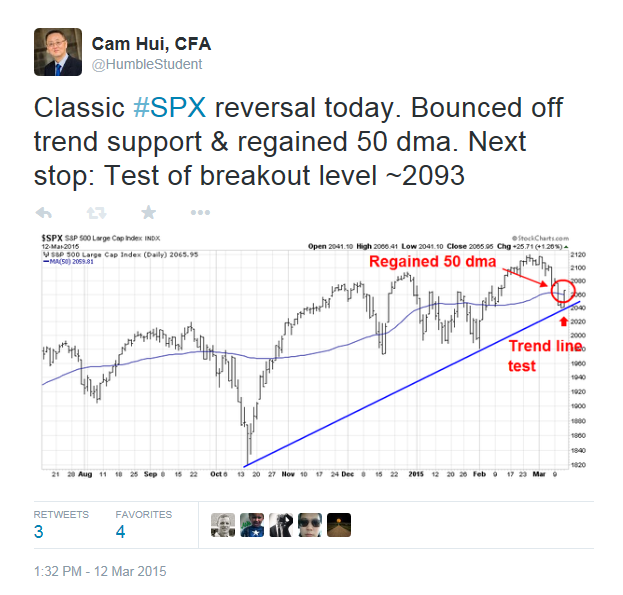 The SPX has the support of the uptrend line depicted below. Should that fail, recent episodes of weakness has been arrested at the 150 dma, which is about 1.5% below the levels seen on Friday. My inner investor remains overweight risky assets. My inner investor is long the market as he is positioned for the potential rebound to come. 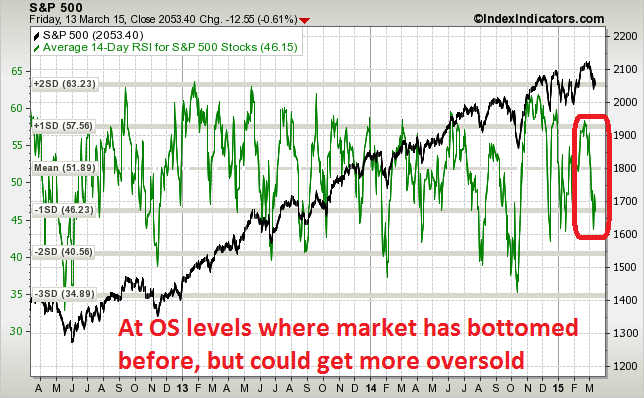 The key test for the stock market is what happens after the oversold rally peters out. Will it continue to grind upwards, exceed the old breakout at about 2093 and test new highs? Or will market strength stall out?